If there is one chair that gives you the sense of coziness and relaxation while having a rustic feel, it’s got to be Adirondack chairs. You most commonly see these chairs on beaches and on the porches of cabins up in the mountains. For some reason, these chairs are synonymous with rustic luxury that makes you want to take a cup of coffee (or your favorite hot beverage) and soak up the peaceful surroundings. 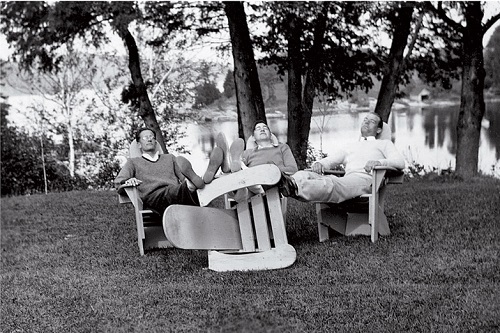 With that said, have you ever wondered about the history of Adirondack chairs? Keep reading, and we’ll give you plenty of information about these chairs, you’ll feel like an expert! Well, maybe not an expert, but you’ll be well informed! 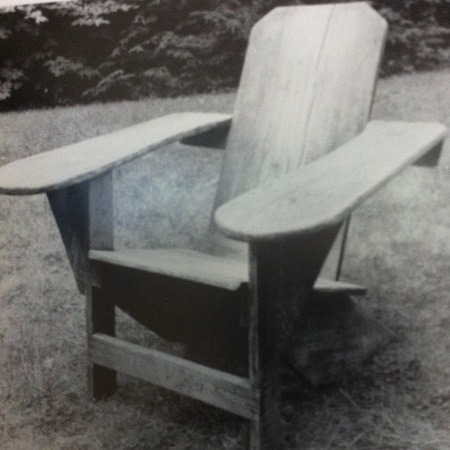 The very first Adirondack chair was built in 1903 by Mr. Thomas Lee. He was desperately seeking a comfortable piece of furniture to sit in while he enjoyed the scenery at his Westport, New York cabin near the Adirondacks. It is said that Lee created several prototypes of the chair. He only used 11 plants of knot-free wood, all from the same tree. Each member of his family was asked to test each chair, and they decided the gentle recline and wide armrests was the most comfortable. Lee had a hunting friend, Harry Bunnell, who was a local carpenter. Bunnell was looking for some way to make off-season income. When Lee showed his friend the chair, he encouraged Bunnell to start making the chairs for people around town. Bunnell patented Lee’s design without Lee knowing in 1905. Over the next 20 years, Bunnell sold the chairs for great profits. Lee never asked Bunnell for any portion of the profits from the chairs sold, it is commonly assumed that Bunnell stole the design from his friend. 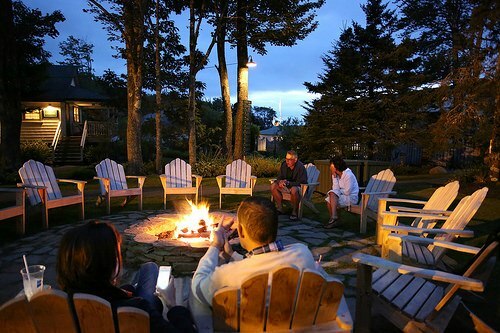 Over the century, Adirondack chair designs have evolved, but they are still quite recognizable. Modern Adirondack chairs have a raked back made from three to seven slats of wood, instead of the single plank from the original design. This change probably occurred because it’s increasingly difficult to find wood that is completely knot-free. Also, a single piece of wood with knots and other imperfections tend to be less comfortable than several slats of the same type of wood, not to mention the chair would be much more expensive. You can find these chairs made out of wood like pine and other affordable types of wood, but you can find plastic Adirondack chairs as well. There are even some Adirondack chairs made from stainless steel, giving you an industrial look. 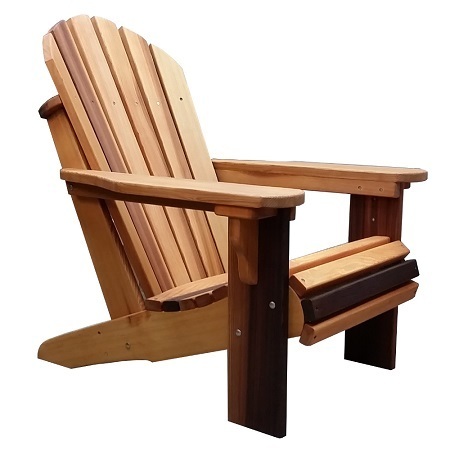 Even though the Adirondack chair has gone through different adaptations throughout the years, they are still easy to recognize and still quite popular. It’s not hard to see why, either. The design is simple, they’re comfortable, and they are unassuming. Rustic Adirondack chairs continue to be appealing to folks because they give a sense of nostalgia to people who sit in them. 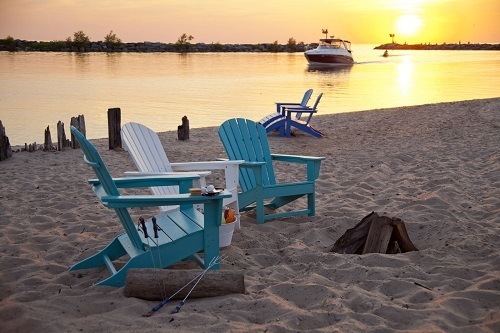 For many designers and owners of the chair, they feel a connection to the past when they relax in wood Adirondack chairs. 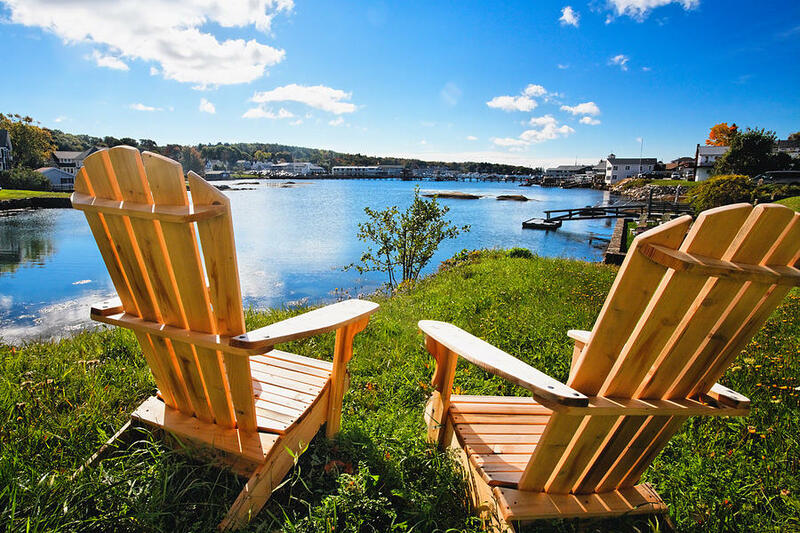 Over the years, the Adirondack chair has seen many incarnations, adaptations, and has been made out of some materials. The wooden incarnation is the most popular among traditionalists. They can be stained or painted to your liking. However, many people tend to prefer unfinished Adirondack chairs, which will eventually turn gray due to being weathered naturally. Teak – Teak Adirondack chairs tend to be incredibly resistant to weather and are very durable. 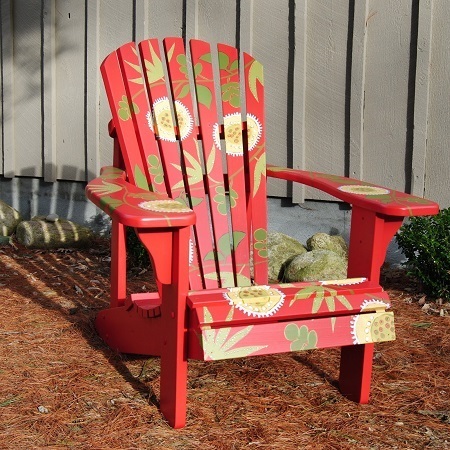 Cedar – Cedar Adirondack chairs are more resistant to cracking and rot due to moisture. Plus the natural scent of the cedar wood acts as a natural bug repellant. Cypress – Cypress Adirondack chairs are strong against warping because the wood has tight grains. The natural oils found in the wood help it from rotting or becoming infested with insects. Pine – Pine Adirondack chairs are usually stained to bring out the unique and desirable knots in the wood. When the chair is maintained properly, it will resist insects, rotting, and weathering, making the life of the chair last much longer. 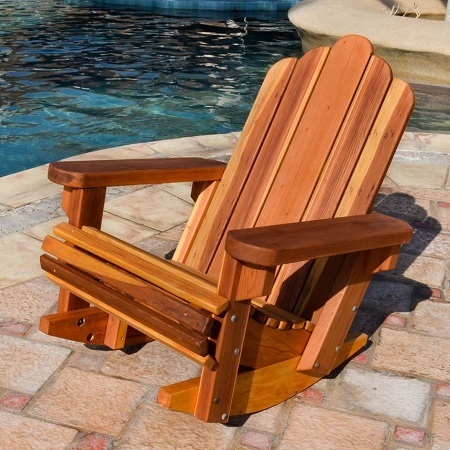 Mahogany – Mahogany Adirondack chairs feature beautiful grains that give the chair plenty of character. It’s more scratch resistant than cedar or pine, and because it is a hardwood with fine grains, it is going to resist decaying much better. Shorea – Shorea Adirondack chairs are perfect if you like the look of wood that has turned shades of silver as it ages. If you prefer to keep the light brown color, you can treat the wood with teak oil. Shorea wood also acts as a repellent to most insects, and it can withstand harsher weather than other wood. Oak – Oak Adirondack chairs are popular because they are able to resist insects and weathering too badly, but they are popular because of their light brown coloring. Of course, we can’t forget to mention that you have the option of purchasing recycled plastic Adirondack chairs if you want an eco-friendly option. 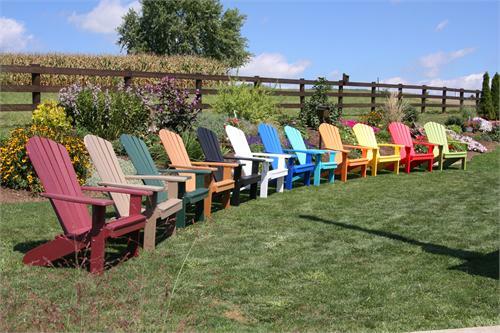 When you’re looking at outdoor Adirondack chairs, you may notice that there are several different styles. You first have the basic chair that features a back that is reclined at a comfortable angle, wide armrests, and it is low to the ground. If you’re looking for a chair that is roomy, this is a good option. It’s simplistic design, and sturdy construction is one of the reasons why you’ll find classic Adirondack chairs on beach resorts in tropical locations. For an updated look, you can choose a modern Adirondack chair that features a stylized backrest, but it still features the same proportions and comfort that you’d receive from the traditional style. Also, the modern versions tend to be painted in bright colors, and they are perfect for usage in the garden amid your favorite flora. Another modern take on the chair is Adirondack rocking chairs. 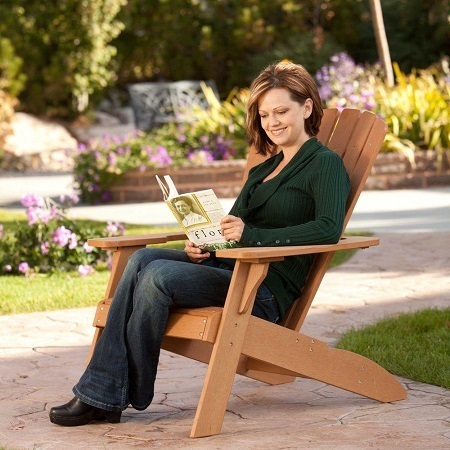 Unlike your typical rocking chair that is narrow and has an upright back, these rockers are roomy like the traditional Adirondack, but instead, it has a rocker bottom. People tend to put these types of chairs on their porches so they can relax and sip on lemonade on a warm summer day. Sounds divine, doesn’t it? For those who like to sunbathe or relax by the pool, you can carry the Adirondack style there too with a couple Adirondack lounge chairs. The lounge chair features the same wide armrests, the reclining back, but instead of sitting, you can lay back and relax with your feet up. Some lounge chairs can be used as a lounger, but when you slide the footrest under the seat, it can be used as a regular seat. Did you know that because Adirondack chairs continue to grow in popularity, there are sets that feature the same style as the chair? 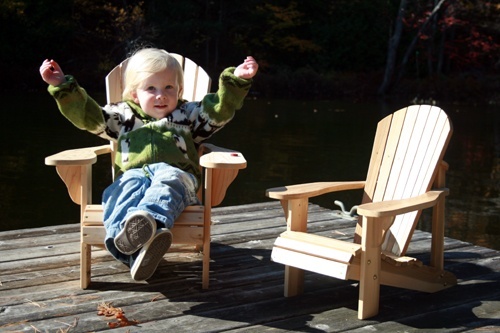 We already mentioned the rocker and lounge chair, but there is also Adirondack loveseats, children chairs, a “dolphin watch” chair, which looks a lot like a miniature lifeguard seat, side tables, and foot rests. Your pets can even enjoy the comfort and style of the Adirondack chair! Much like other patio sets, you can find a variety of accessories for these chairs. The most common being special head cushions for Adirondack chairs. These cushions add to the comfort of the chair by giving you a comfortable place to rest your head while you are relaxing. 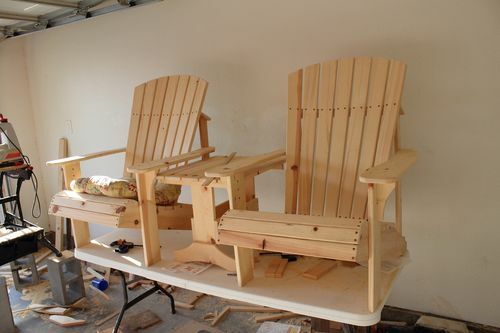 For those who are handy with a set of power tools and feel like you are ready for a weekend project, here are simple step-by-step instructions on how to build your own cedar Adirondack chairs, brought to you by Popular Mechanics via Instructables.com. Set out the side-rail shape on the wood and cut the lines with your jigsaw. Sand the edges so they are smooth. Then you will cut the back rails to size and then create the curves to give it that concave shape that you’re looking for with your saw. Also, be aware that the cut for the top rail is going to be square, but the bottom rail has a 7-degree bevel. Cut the slates for the seat to the size specified and round out the top edges for each slat with a 1/4-inch quarter round bit on your router table. Then you will round out the exposed edges. 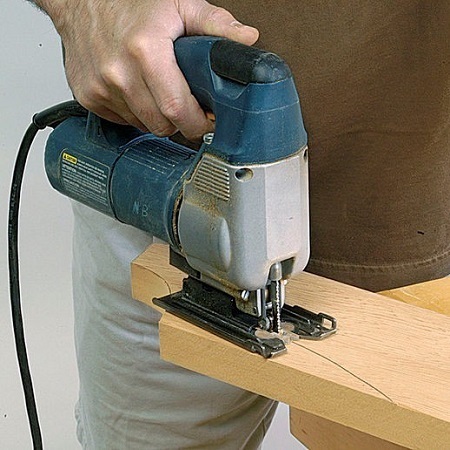 You’ll want to keep your router table set up so you can round out the other edges for the chair as you make them. Be aware that because of the shape of the seat, you are going to have to bevel one or both edges of the slats for the seats. You can use a table saw or a hand plane to create these bevels. Begin the seat assembly by screwing the lower back rail to the seat sides with one screw at either end of the rail. Then you will want to add slat number 4 as seen on the drawing with a single screw at either end. You will want to measure opposite diagonals of the frame and adjust until everything is square. Once you’re satisfied with this, you can add the second screw on each of the slats next to the first screw. Begin the seat assembly by screwing the lower back rail to the seat sides with one screw at either end of the rail. Then you will want to add slat number 4 as seen on the drawing with a single screw at either end. You will want to measure opposite diagonals of the frame and adjust until everything is square. Once you’re satisfied with this, you can add the second screw on each of the slats next to the first screw. For the front legs, cut them and round out the long edges on your router table. Create a line on the inside of the leg to show where the bottom edge of the side rail will go. 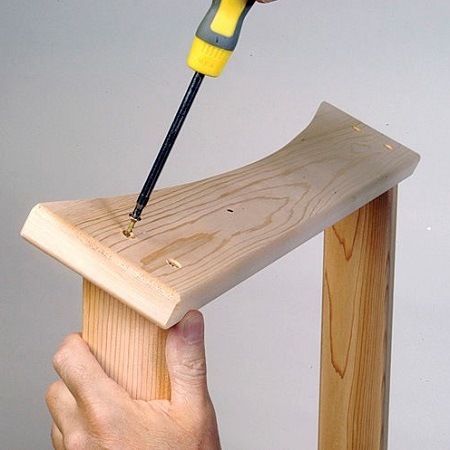 Then you are going to attach the legs from the inside of the side rails with screws. The slats for the back are tapered so that they are going to create a fan shaped when they’ve been installed. 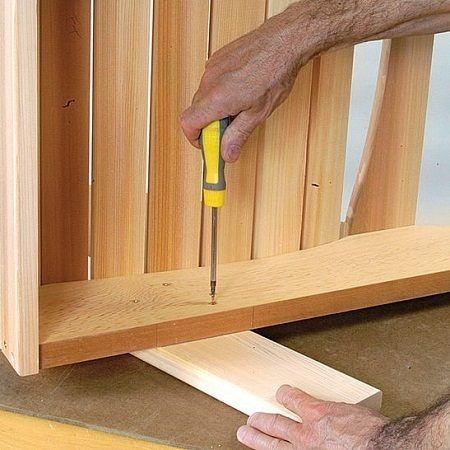 Cut each 35 1/2-inch long slat 3 1/4-inches wide on one side and the other at 2 1/4-inches wide. This can be done with either a band saw or a jigsaw. Smooth all the edges and cut a curved top and sand those, too. Then you will want to cut the hind legs to size, angling the top edge to 64 degrees. Clamp the rear legs to the side rail. Then you will bore and countersink pilot holes for screws and then secure them in place. Screw the top back rail at the top ends of the hind legs. 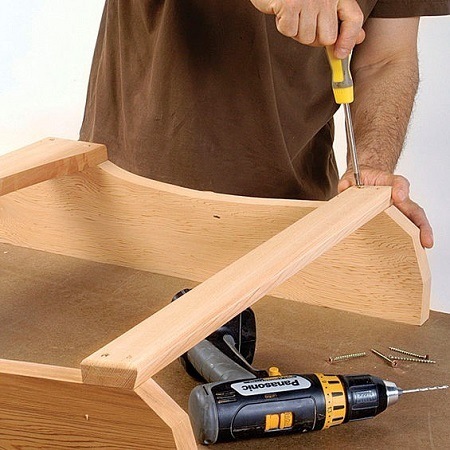 Lay the chair on the side so you can attach the back slats easier. Place a 4-inch black under the top part of the back rail to give you enough space for the back slats. Mark the center of the top and bottom back rails and then align the center back slat to the marks and screw in place. Attach the two outer slats and then secure the rest of the slats so the top curve ends are aligned and the space in between is even. Because the back slats are the focal point of the chair, you don’t want to have any gaps that are too large or too small, as it’ll draw your eye. Cut the arms and arm supports and then round out the edges. 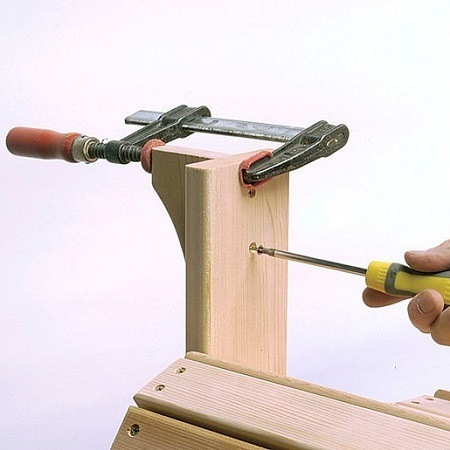 Clamp the supports in place while you secure them in place with screws. Finally, attach the arms to the legs with screws. While Adirondack chairs are used outdoors and use a material that is suitable to withstand all sorts of weather, it is still recommended that you care for your chairs so you can enjoy them for years to come. Here are general guidelines on how to care for your chairs. Generally speaking, Adirondack chairs that have been painted can look great up to five years if the right steps were followed to ensure a professional finish. Granted, while the painted chair will look great for the first year or so, it may not be the best option to paint your chairs because, over time, the paint will chip, peel, and even bubble. When that happens, you’re going to spend several hours removing the paint so that you can paint it again. Now, if you don’t mind the scraping and sanding that you’ll have to do before you can repaint, then this is a great option for you—especially if you want to add a pop of color to your garden or patio. When you’re looking for paint for your chairs, you’re going to want to find a formula that has a high UV rating, which is basically like sunblock for your chairs. Just like sunblock, the high the number is, the longer the paint will last. Typically, good quality paint is going to have a higher UV number, and you’ll want to spend the few extra dollars to ensure the paint lasts. Depending on how heavy you want the finish to be, you can leave it at two coats, or you can just add a clear top coat. If you prefer the natural weathering of your chairs, you’ll still want to care for it so you can continue to enjoy it for years to come. The older your chair gets, the more pronounced the wood grain will become because it is drying out. You can fix this pretty easily just by sanding it to keep it smooth. If you have chairs that have already been finished, you’re going to want to keep them looking new! This is going to be a yearly thing, but the maintenance is relatively simple. All you’ll need to do is make sure the chair is free of dust and debris, then just wipe it down with Cetol 1 by Sikkens. If you want a smooth chair, you can sand it lightly wherever it is rough. After a few years, you may have to work a little harder to revitalize your chair’s beautiful finish. When treating your chairs, you will want to sand and re-stain it in a ventilated area. If you have plastic Adirondack chairs, maintenance is going to be simpler than wood. All you have to do is store the chairs in your garage during the winter, or cover them with chair covers made specifically to fit the chair. 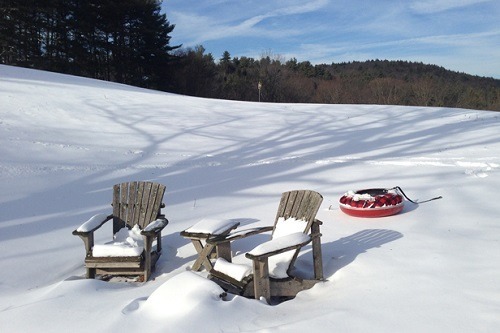 If you have all-weather chairs, then you don’t have to worry about storing them at all. When you want to clean these chairs, all you need to do is use some warm soapy water and wash the chair as you would your car. Be mindful to avoid harsh chemicals though because they could weaken the plastic after prolong use. When it comes to your chairs, you may have some questions. We’ve got you covered! 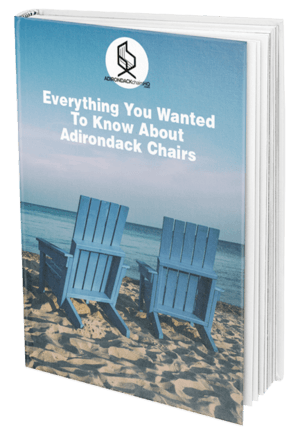 Here are some frequently asked questions regarding the care of your Adirondack chairs. Natural weathering is when your wood furniture naturally ages and changes color without stain or any type of finish. Over the life of your chair, it will slowly weather and will become a silvery-grey color. The grain of the wood will also raise slightly. If you leave your chair as is, the silvery color will become highlighted by darker streaks as a result of how the wood will react to the hardware used to keep it together. If you notice small cracks in the surface of the wood of your chair, you needn’t worry about the structural integrity, as those cracks are just on the surface. It’s the result of the wood drying out and is a natural occurrence in wood furniture. Adirondack chairs are a great addition to any outdoor space, not only because they are classic symbols of relaxation and tranquility, but because they are known for their longevity and comfort. Perhaps Thomas Lee really knew his stuff when he first created the chair back in 1903, because the chair has remained a popular piece of outdoor furniture throughout the years. Perhaps one of the best things about these chairs is that they can appeal to many different styles and aesthetics. If you have a cabin in the woods, you can leave the chair natural and let the elements age the untreated wood to a beautiful silvery-grey color. If you have a fun beach house, you can use colorful paint to decorate your chairs and relax on the beach. Of course, you can also stain the chairs a beautiful golden color and relax in your garden. One thing is certain, these chairs are a classic piece of furniture that will continue to be a favorite for years to come.